at the Ruth Page Center for the Arts, 1016 N. Dearborn St., Chicago. Here at ChiIL Mama, we've been ardent fans of Chicago Children's Theatre since its launch in 2005. My kids were 2 and 4 year old toddlers then and they've grown up with Chicago Children's Theatre. CCT is truly a staple of Chicago's family friendly theatre scene with world class productions that parents enjoy as much as their children. Over the years CCT has cemented its reputation as the city's largest professional theater company devoted exclusively to children and young families. We've adored this all-time favorite since Chicago Children's Theatre first presented The Hundred Dresses back in 2009. This smash hit musical is about a young girl who struggles with bullying and learns what it takes to stand up to others - even when you're standing alone. Click HERE to check out a blast from the past and see ChiIL Mama's coverage of The Hundred Dresses from 8 years ago!! My son (8) and daughter (6) enjoying the pre-show coloring in the lobby. Signed programs became a treasured keepsake. Check out my Jr. Critic Kids, Dugan (8) & Sage (6) enthusiastically getting their programs signed after the show. We even bought the book and read it as a family after the kids loved the 2009 production so much. Adapted and created by Ralph "Ralph's World" Covert and G. Riley Mills, the original 2009 world premiere was one of Chicago Children's Theatre's biggest hits ever, prompting the Chicago Tribune to proclaim CCT had "delivered on its promise to elevate the experience of children's theater in this city." Now The Hundred Dresses is back, directed again by Sean Graney, artistic director of The Hypocrites (another of our favorites here at ChiIL Mama & ChiIL Live Shows!! 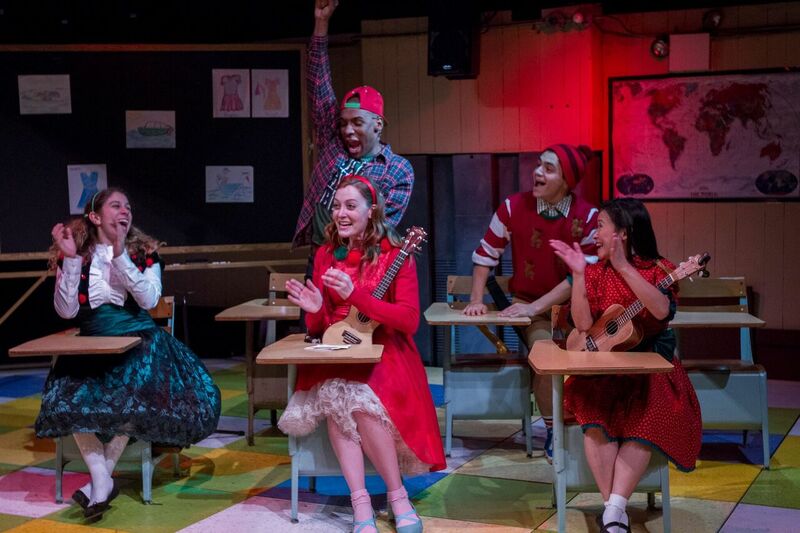 ), and it's ready to engage a whole new generation of Chicago children with its funny, touching story, prankster school boy characters, girls in a rainbow of dresses, high-energy rock music, and fun, creative choreography, all tied together with a poignant and timely anti-bullying message. Meet Wanda Petronski, the new girl in school. Wanda talks with a funny foreign accent and wears the same faded blue dress to school every day. Yet she swears her closet back home is lined with 100 beautiful silk dresses. Still, the "mean girls" at school pick on Wanda relentlessly. And those who stand by silently soon learn that doing nothing can be the worst form of bullying of all. 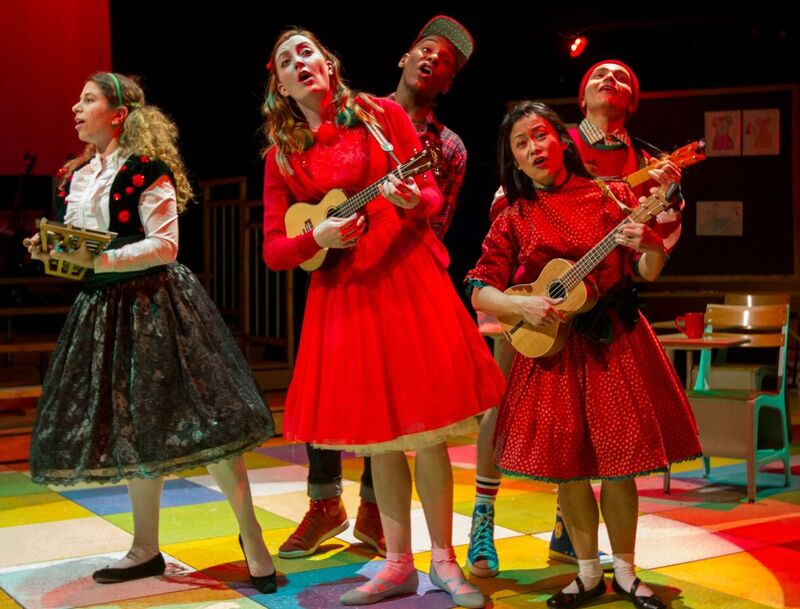 Based on Eleanor Estes' timeless children's novel, Chicago Children's Theatre's smash hit The Hundred Dresses takes audiences of all ages on a fun, funny, heartwarming musical journey that explores the bonds of friendship and the courage to be yourself. Performances run through February 12, 2017 at the Ruth Page Center for the Arts, 1016 N. Dearborn St., Chicago. Show times are Tuesdays through Friday at 10 a.m., Saturdays at 11 a.m., 2 p.m. and 6 p.m., and Sundays at 11 a.m. and 2 p.m. The Hundred Dresses runs approximately one hour and is ideal for ages 6 to adult. Single tickets are $10-$39. For tickets and information, visit chicagochildrenstheatre.org or call (872) 222-9555. Chicago Children's Theatre's performance home, the Ruth Page Center for the Arts, is convenient to public transportation, surrounded by family-friendly restaurants and located just steps from the Magnificent Mile. (773) 227-0180 x 15 to learn more. Click here to register for a free touch tour of The Hundred Dresses during our next Access Weekend: February 4-5. For more information about access services, visit chicagochildrensteatre.org/access or contact access administrator Alex Mauney at cmauney@chicagochildrenstheatre.org. Penny Paddywhack from Chicago Children's Theatre on Vimeo. 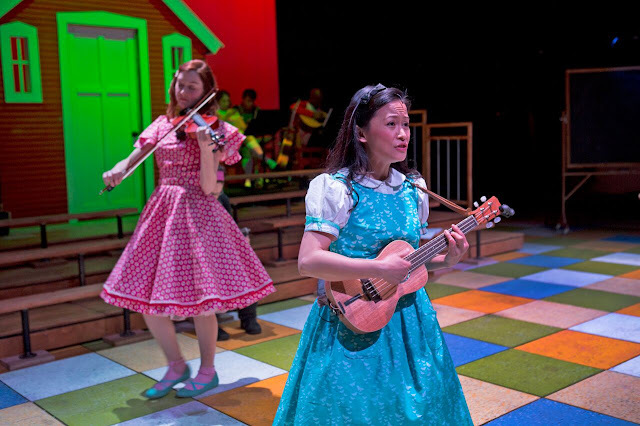 Chicago Children's Theatre premiered The Hundred Dresses in 2009 at the Royal George Theatre to unanimous critical acclaim and numerous sold out houses. 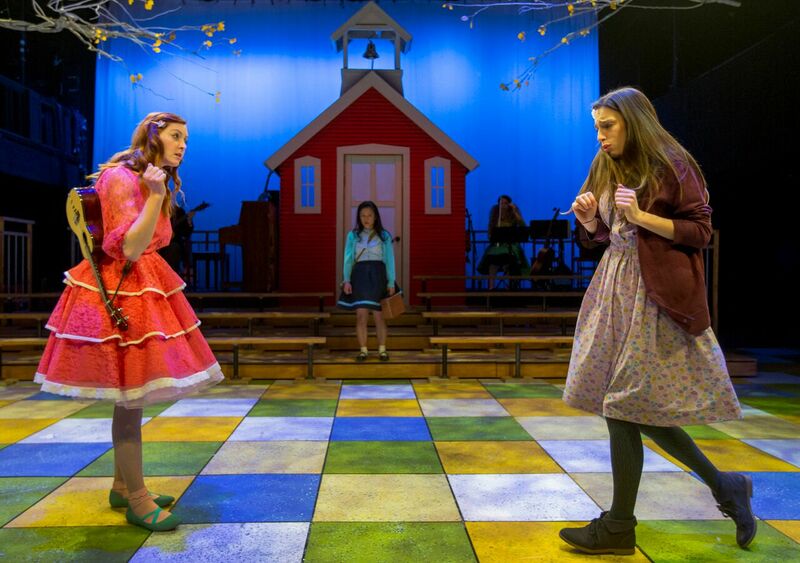 The musical was revived in 2011 due to popular demand at the North Shore Center for the Performing Arts in Skokie. Time Out New York Kids hailed its subsequent 2012 off-Broadway run at Atlantic Theater Company "an emotional tour de force that takes on childhood prejudice, bullying, insecurity and the poignant awakening of conscience with sensitivity and panache." The play was published by Dramatic Publishing and has since been performed at theaters for young audiences, high schools and colleges throughout the U.S.
"From a pure entertainment perspective, The Hundred Dresses delivers on all counts - a beloved children's story told in a whole new way by an amazing cast, a funky rock 'n roll score, fantastic choreography, eye candy costumes and top-notch production value all around," said Jacqueline Russell, Artistic Director, Chicago Children's Theatre. "At the same time, the play's core anti-bullying message strikes an undeniable chord with children, parents and educators. As a theater devoted to tackling important social issues impacting youth today, we think The Hundred Dresses is the ideal production to introduce our work to a new generation of Chicago children and families." The cast for The Hundred Dresses features Emily Berman (Wanda), Christine Bunuan (Maddie), Danielle Davis (Miss Mason), Donterrio Johnson (Jack), Matt Kahler (Jan/Old Man Svenson), Nik Kmiecik (Willie Bounce), Dana Omar (Cecile) and Erin O'Shea (Peggy). The production team includes Andra Velis Simon, arranger/music director; Tommy Rapley, choreographer;John Musial, set; Samantha Jones, costumes; Heather Gilbert, lights; Ray Nardelli, sound; and Mealah Heidenreich, props. Production stage manager is Katrina Hermann. Assistant stage manager is Andi Sturtevant. Ralph Covert (playwright, composer, lyricist) is best known best to parents and children as the creator of Ralph's World, the mega-fun musical planet where kids rock rock rock and dance dance dance to their own and their parents' delight. Covert came to public attention with his first rock 'n' roll band, longtime Midwestern faves The Bad Examples. He was also teaching contemporary songwriting at the time at the venerable Old Town School Of Folk Music when he became a father. Then Education Director Jacqueline Russell, who today is the Artistic Director of Chicago Children's Theatre, asked Covert to handle some Wiggleworms toddler sessions on his own terms, i.e., no musical compromises save for the lyrics. The result is a treasure trove of music that parents and their children can equally love. There are eight compact discs of Ralph's World music on Disney Sound plus the award-winning Say Hello DVD (Parenting Magazine's 2003 Video of the Year) and Bar/None's All Around Ralph's World. Covert's national media appearances for Ralph's World include NPR's All Things Considered, ABC World News Tonight, The CBS Morning Show, and Sirius XM Kids Radio New Year's Eve broadcast. His praise in print includes The New York Times, Newsweek, Time, People and Parade. He has four published books as a children's author, and also serves with several national educational initiatives. Visit ralphsworld.com for his children's music and waterdogmusic.com for his grown-up rock. G. Riley Mills (playwright and lyricist) has written for the professional theater since 1987. He and Ralph Covert have twice been awarded Jeff Citations for Best New Work (1998 and 2001). Together they have two published books: Sawdust and Spangles (2007 NAPPA Honor Award winner) and A Nutty Nutcracker Christmas. Other Chicago productions include Death and Devils (Polarity Ensemble Theatre), Raising Blue (Prop Thtr), Streeterville (TimeLine Theatre Company) and The Great Egress (Mary-Arrchie). Mills is cofounder of the Chicago-based global communications training company Pinnacle Performance Company, and teaches effective communication to executives and CEOs across the globe. He co-founded the not-for-profit company called The Bookwallah Organization (bookwallah.org) that collects and distributes children's books to orphanages across the world. Sean Graney's (director) previous Chicago Children's Theatre directing credits include Honus and Me and Hana's Suitcase. He is the Artistic Director and Founder of The Hypocrites, where his most recent project was directing Cinderella at the Theater of Potatoes by Andra Velis Simon, arranger/music director of The Hundred Dresses. Graney has directed over 30 productions since 1997. He has won three Jeff Citations for Outstanding Direction for All Our Tragic, Equus and Machinal. In 2004, Chicago Magazine identified him as Chicago's Best Avant-garde Director. He also directed Edward II (Chicago Shakespeare Theatre), The Elephant Man (Steppenwolf Young Audiences) and The Comedy of Errors, What the Butler Saw and Mystery of Irma Vep (Court Theater). Has your child asked to take a gap year? Let them find out what it's really like with CCT's world premiere of The Year I Didn't Go to School: A Homemade Circus. Created and directed by Lookingglass Artistic Director Heidi Stillman and based on the popular Giselle Potter picture book, this all-new production will be a thrilling experience for all ages, filled with circus arts, February 28-March 26, 2017. Brown Bear, Brown Bear & Other Treasured Stories by Eric Carle, presented by Mermaid Theatre of Nova Scotia, closes Chicago Children's Theatre's 11th season, May 2-28, 2017. 1016 N. Dearborn St., Chicago. For tickets and information, visit chicagochildrenstheatre.org or call (872) 222-9555. 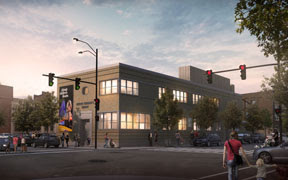 In addition to presenting its 2016-17 mainstage season at the Ruth Page, CCT is busy transforming the former 12th District Police Station at 100 S. Racine Avenue in Chicago's West Loop into a beautiful, mixed-use performing arts and education facility designed to serve all Chicago families. Now nearly complete and set to open in January, the adaptive reuse of the former police station at 100 S. Racine, aka "The Station," is Phase One of what will eventually be the new, expanded footprint for Chicago Children's Theatre. 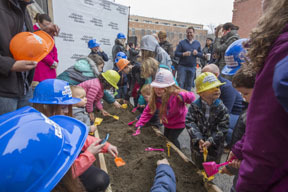 Chicago Children's Theatre is calling its new home The Station in homage to its history as a former police station, and to underscore the building's focus on education and community engagement. This first phase encompasses five classrooms, a dedicated, year round space for Red Kite interactive theater for students with autism, a lobby with box office and concessions, and the flexible, 149-seat Pritzker Family Studio Theatre. The world premiere of Magic City, created by Chicago's internationally acclaimed shadow puppet theater Manual Cinema, will christen Chicago Children's Theatre's new performance space at The Station, January 27-February 19, 2017. In sum, The Station will be a new destination for all of Chicago's children to immerse themselves in inclusion, unique arts education, community galvanizing, diversity and STEAM (science, technology, engineering, art and math) curricula. 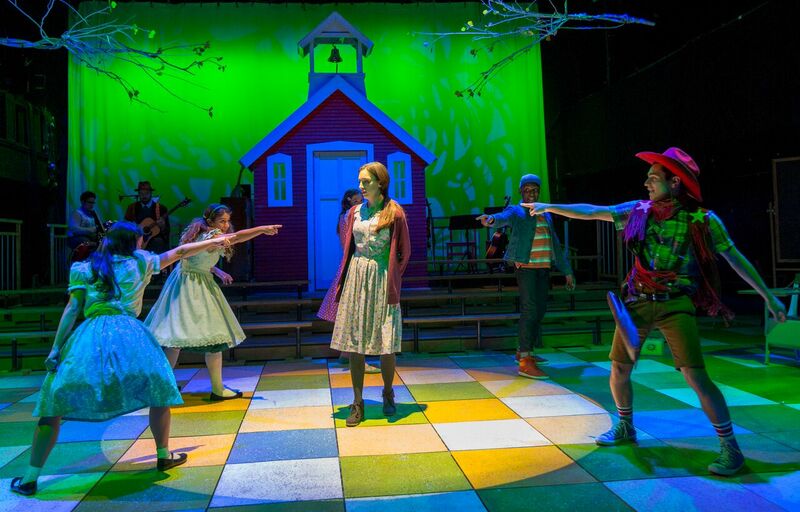 Chicago Children's Theatre is utilizing Chicago's finest theater and visual artists, as well as partnering with renowned institutions to offer courses and camps for children ages 0 to 14. The first eight-week session launches Monday, February 6, 2017. Registration is now open at chicagochildrenstheatre.org/classes for classes in storytelling, modern movement, hip-hop, aerial and circus arts and vocal instruction. Phase Two of Chicago Children's Theatre's new building is anchored by a second, 299-seat mainstage theater, scheduled for completion in 2020. Moon Shot: A Race to Space (a Theater Unspeakable production, commissioned by Palo Alto Children's Theatre.) These enjoyed highly successful inaugural runs in Chicago, followed by new productions at family theaters across the U.S.
Click HERE for more information, or call (773) 227-0180.